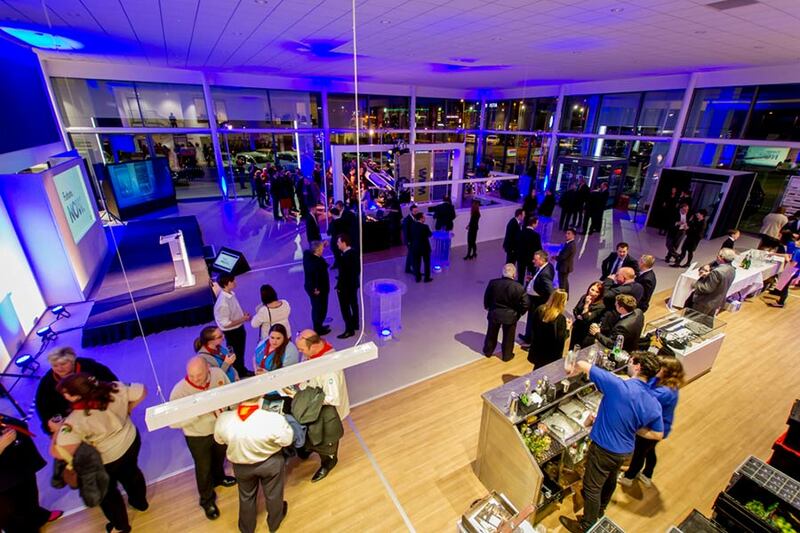 Volkswagen Milton Park engaged TMB Events to provide event management support during the launch event of the all-new purpose built showroom. The event had to work on a number of levels: to engage with the local VW owners, to attract potential new customers, to raise awareness of the facilities in the area, to generate PR and to display a very considerate commitment to efficient budget management. In spite of the high aims, the creative approach taken by our Entertainment team succeeded in satisfying guests, media and clients in equal measure. The “racing bugs”, an activity supplied by TMB generated plenty of buzz among the 140 guests who joined the evening and the internal and external uplighters and the graffiti wall brought just the right amount of tech-edge and visual interest outside the facilities and on the showroom floor. Of course, there is no event these days without a photo booth – and the Milton Park launch was no different. A small expense but one that went a long way to please attending guests. Another crown-pleaser was the XL1 prototype which attracted great interest and was a fantastic conversation starter for staff and guests alike. The event benefitted further from an injection of TV glam through the presence of a well-known sports presenter, who as a committed VW fan, acted as a voluntary compere during the evening. The Milton Park Showroom launch was exactly the type of event where the discrete and efficient presence of our event professionals made the difference between good and great. We wish the team at Milton Park every success! They sure got off to a great start!